The national media was buzzing last week as Tia Denton, a school bus driver for Columbus City Schools in Columbus, Ohio, was sentenced to five days in jail and two years of probation for driving a school bus full of children while she was under the influence of alcohol in November of last year. According to news reports about the case, 51-year-old Tia Denton was pulled over by a Columbus police officer on November 25, 2013 for driving erratically. Court documents show that there were several children on board the bus at the time as she was taking them home from Southwood Elementary School. Police believed that Denton had displayed signs of being impaired, so they subjected her to a breathalyzer test. 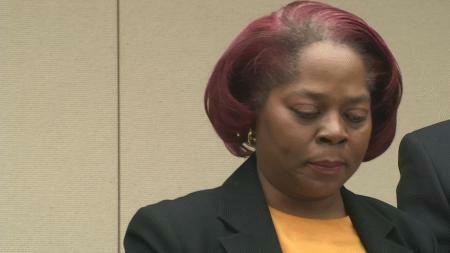 She allegedly recorded a .216 percent blood-alcohol level, which is nearly three times the legal limit of .08 percent. In December, Denton pleaded guilty to misdemeanor charges of drunken driving and endangering children. On February 11, Franklin County Municipal Judge Paul Herbert sentenced Denton to the maximum 180 days in jail on each of the two counts, but eventually suspended all but five of those days. According to news reports, the judge suspended most of the jail sentence based on the fact that Denton cooperated fully with police, showed extreme remorse for her actions and did not have a prior criminal record. Dion and Angela Williams, whose son was on board the bus that Denton was driving and suffered whiplash injuries and a concussion as a result of her reckless driving, were both in attendance at the bus driver’s sentencing hearing. While many people throughout the country expressed disgust at such a light sentencing for a person who endangered the lives of several children, the Williamses gave mixed reactions to the verdict. Upon further investigation, it was discovered that Denton had been drinking until as late as 3 a.m. the previous night before beginning her morning route. But one of the most shocking details to come to light in the investigation was the fact that Denton purchased an additional bottle of whiskey at approximately 9 a.m., and police officers found it partially consumed on the floor of the bus. 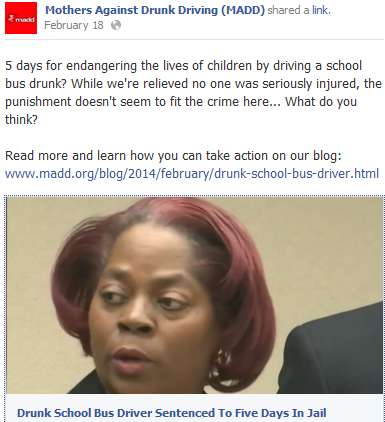 On Tuesday, Mothers Against Drunk Driving (MADD) posted a link to an article about the incident on its official Facebook page, in which the organization expressed disgust at the light sentencing. “5 days for endangering the lives of children by driving a school bus drunk? While we’re relieved no one was seriously injured, the punishment doesn’t seem to fit the crime here,” the organization said to its nearly 100,000 followers. Davis Law Group is a proud supporter of MADD and its mission to eliminate injuries and fatalities that result from drunk driving accidents, and we join them in detesting light sentences for people who put the lives of innocent drivers – and children, in this case – at serious risk.